In addition to simply converting guitar sounds into unsurpassed digital audio, the TonePort included a masterful application called GearBox, which faithfully reproduced the sounds of an all but unlimited basement full of contemporary and historical amplifiers, cabinets and effects pedals. GearBox was like having every guitar toy ever invented on screen, and no need of any patch cords. The only drawback to our Line 6 TonePort UX2 was that it became sufficiently popular in house as to make getting face time with it increasingly difficult, and after a while we decided that buying a second one would be preferable to the growing rumble of arguments between several people armed with lengths of wood. Thus it was that we found the Line 6 POD Farm UX2. Honesty bids me say that we actually Googled for “Line 6” and “UX2,” and that we didn’t notice that the name between these search terms had changed until the box actually arrived. This was, in reflection, something of an oversight on our part. The Line 6 POD Farm UX2 consists of effectively the same hardware as the earlier Line 6 TonePort UX2. The front of the device is black rather than red, and it’s likely that there are some internal refinements beneath its plastic skin, but it’s every bit as cool to look at and intuitive to use as its ancestor. 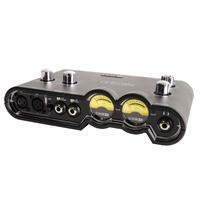 It offers two XLR microphone inputs with switchable phantom power, two quarter-inch guitar inputs – one with an attenuator – and a quarter-inch headphone jack. The front of the case features a pair of genuine lighted analog level meters that look totally retro, and are way more useful than a string of LEDs. At the back of the Line 6 POD Farm UX2, a USB jack waits to connect the device to any suitable PC. It’s worth noting that because timing is everything in recording hardware, the UX2 wants to be wired directly to the USB connector of a computer, rather than being added to a USB hub. There are also analog line inputs and outputs back there, a digital S/PDIF output and foot switch jacks. While it would be some while before we could ultimately use our new UX2 device, I’ll skip briefly to the car chase of the story and note that when it finally found itself on line and working, the Line 6 POD Farm UX2 was every bit as splendid and breathtakingly impressive as our earlier UX2. Its sound quality was flawless, its user interface was a peach to play through and its hardware was so simple to operate as to be comprehensible by most houseplants and one in four liberal politicians. Getting it working, however, was a descent into drooling, shrieking madness sufficient to make lesser modes of insanity seem like mild headaches by comparison. The Line 6 POD Farm UX2 packaging includes the UX2 hardware, some cardboard bits to keep said hardware from rattling, several nicely printed warrantee cards and four CD-ROMs to install software. I haven’t omitted mention of the extensive printed documentation one might presume to find included with a box of technology this sophisticated – there wasn’t a word of it. The UX2 includes CD-ROMs to install Reason Adapted, a visual studio; Riffworks 4, which describes itself as “instant idea capture;” Live Lite 7, a basic sixteen-track digital recorder; and POD Farm. A process of elimination suggested that the POD Farm CD-ROM would be the one to light up the UX2 hardware, this being the name on the box. Installing the POD Farm software is a bit like playing in an unlighted room to an entirely invisible audience. Its installer, while professional and functional, is less than forthcoming about what’s happening, or what all the funny words mean. It does prompt you to disconnect and reconnect the USB cable for the UX2 hardware from time to time. It also pops up a number of windows during installation, which subsequently vanish too quickly to be read… always a disturbing phenomenon. With the POD Farm software installed, a mere double-click upon its desktop shortcut lights up the works… and informs its user that POD Farm will refuse to process any audio until the software has been granted leave to phone home over an Internet connection. Authorization is handled by something called Line Monkey. Line Monkey is an evil, leering little primate with the disposition of a recalcitrant zoo animal. Clicking to run Line Monkey didn’t get us to anything that looked like it would ultimately enable POD Farm. It began by insisting that we create an account at Line 6’s web page, a process that wanted a substantial amount of personal information just to enable a product we’d already paid for. Thereafter, all Line Monkey was interested in was downloading updates to the POD Farm software and its drivers. The computer that the Line 6 POD Farm UX2 had been installed on accesses the Internet through a 3G mobile Internet hub with claustrophobically-restricted bandwidth. Line Monkey ultimately insisted on replacing almost the entire install CD-ROM as downloads, and it refused to allow POD Farm to play so much as a single diminished seventh chord until it was given leave to do so. Things threatened to get expensive. With POD Farm updated to the satisfaction of the Line Monkey software, we finally got to activate it… which entailed logging into the aforementioned account at Line 6’s web page, unplugging and replugging the UX2 hardware several times, downloading still more stuff and encountering a number of cryptic and ostensibly misleading warnings. The grand adventure of awakening the Line 6 POD Farm UX2 ultimately occupied several hours, and about half that time was expended wandering the unmarked blind alleys and stygian catacombs of the Line 6 registration process, a journey which could have been a great deal less wearying had the system been accompanied by some cogent instructions. Once it’s been installed and registered with a specific computer, it’s more or less stuck there. While physically moving it to a different machine is effortless, unregistering it on one computer and reregistering it on another is prohibitively involved. Line 6 doesn’t appear to provide any e-mail support for the Line 6 POD Farm UX2 per se. If you run into difficulty installing or using it, you can pose questions about it at their support forum, browse the Line 6 knowledge base or you can phone Line 6 and listen to a machine for a while. The POD Farm software that’s included with the $199 Line 6 POD Farm UX2 is a somewhat lower-end application. It will provide you with 18 guitar amplifiers, 5 bass amplifiers and 29 effects, among others. The really cool “platinum” manifestation of POD Farm, with 78 guitar amplifiers, 28 bass amplifiers and 97 effects… among others… is a $299 download. While we didn’t encounter any genuine hardware or operating system issues that prevented the Line 6 POD Farm UX2 from working, a quick browse through the Line 6 support forum suggests that we might have gotten off lucky. The paucity of support options for the UX2 isn’t to be dismissed lightly. Once we got it working… and we stopped screaming… the POD Farm application proved to be decidedly cool. Highly visual and expertly executed, it offers a library of real and imagined amplifiers, cabinets, preamps, pedals, reverbs delays, equalizers and other toys that can be selected and virtually patched together to create complex, generally awesome effects. All the technology involved is represented by detailed, engaging graphics of what it would have looked like in the real world, and everything works by clicking and dragging this virtual hardware around a virtual studio. The devices all pop up with intelligently-chosen defaults, and as such, they play well right out of the box. The help for the POD Farm software is somewhat terse, and in a few cases genuinely misleading, especially when it addresses the issue paying for licenses for the software. To its credit, most users of POD Farm will probably never have cause to crack its manual. You can spend days noodling with POD Farm, and you’ll enjoy every one of them. Our experience of it is that never crashed, never malfunctioned and always behaved intuitively, doing exactly what its virtual sound hardware would lead one to expect. It was only at the conclusion of the installation of POD Farm that we realized that the GearBox software which had made our first UX2 such a blast to use was conspicuously absent. While POD Farm is engaging to work with, it’s also grotesquely time consuming if you want to create specific effects and you have a reasonable idea of how to arrive at them. The much less sophisticated GearBox software, while presupposing that its users knew something of electric guitars and their attendant technology, had been way quicker to work with. I’m certain I need not observe that the GearBox software for our TonePort UX2 wanted nothing to do with the POD Farm UX2, despite the apparent similarity of the hardware involved. I ultimately posed this issue at the Line 6 support forum, and someone who called himself BigChas52 replied about an hour later, observing that the current release of GearBox was a free download from the Line 6 web page, and that this GearBox would be happy to communicate with our POD Farm UX2 hardware. Our Internet bandwidth cap was pretty much nuked by this point anyway. BigChas52 clearly knew his stuff – the downloaded GearBox did in fact fire up our UX2, and it didn’t require recourse to the gibbering of Line Monkey, nor any sort of registration or signatures in blood. It worked flawlessly as well, and it returned our new UX2 to the domain of simple knobs, buttons and easily comprehensible visual metaphors. Installing GearBox in addition to POD Farm seems like an obvious resolution to our concerns in retrospect – in our defense, it does presuppose knowing that the updated GearBox exists and subsequently being able to track it down. This is why BigChas52 makes the big bucks… or at least, why he deserves to. I should note that the installation procedure for GearBox occupied well over half an hour… I have no idea what it was up to during that time. If you too decide that the past works and you download GearBox, keep in mind that while its installer looks like it’s unrecoverably hung at several stages of its deliberations, it’s really just thinking very, very hard. I’ve yet to happen upon another PC sound interface that functions as superbly or is as easy to interact with an the Line 6 UX2 hardware, and I find myself guardedly pleased with our latest one. The machine itself works well, the included POD Farm software works when we have the time to wrestle with it and the downloaded GearBox software works every bit as effortlessly as we could have hoped. This said, the creators of this product have clearly overlooked the observation that the activity performed upon the instruments plugged into such a device is called “playing.” Music toys are supposed to be enjoyable to use… right out of the box. The Line 6 POD Farm UX2 failed abjectly in this regard, and considering how well it performed thereafter, I find this to be a decided shame.